Need a pre-purchase inspection? Rapid Building Inspections will make a comprehensive inspection and provide a detailed report containing all you need to know. The best prices and most qualified inspectors in Caloundra, book now to buy and be confident in your property purchase! Cutting-Edge Technology: We use the latest thermal and moisture sensing equipment available. Yes, you can be on-site when the inspection is taking place, all we ask is that you allow the inspector to conduct his inspection unhindered and save questions until he is finished. This helps to ensure a thorough and uncompromised report (you can discuss issues at the end). We will give you a comprehensive report that follows Australian Standards and Quality Guidelines and is recognised by real estate agents and solicitors in Caloundra. We’ve designed the report to give you the information you need to make an educated decision about purchasing a property (or not). RBI’s highly-qualified inspectors can show you what’s wrong now and what might be a problem in the future. He will sniff out defects and attempts to hide the evidence of them. Armed with all the tools-of-the-trade, they’ll never miss a trick. If necessary, our inspectors can even use radar and thermal sensing equipment to check inside walls and cavities – all included in our fixed, industry-beating price. Gone are the days when pest inspections meant the need to drill, tap and sometimes even rip out sections of wall. These methods were not only intrusive, they also often missed nest areas deep in the building’s structure. Today, Rapid Building Inspections use state-of-the-art technology to detect pests leaving the building undisturbed. A combination of thermal and moisture sensing plus radar technology will detect problems through walls without leaving a trace. 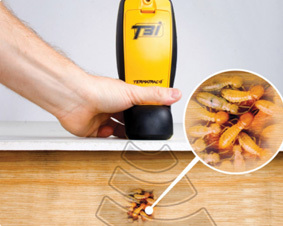 Our inspectors are all trained to use and equipped with the Termatrac t3i device, the only device on the market able to make a precise determination of the presence of termites without damaging the property. Prepared according to Australian Standards AS4349.1-2007 and AS4349.3 and written in plain English for the layman to follow easily, our inspection reports are straightforward and clear, and confirm to legal requirements. We’ll highlight everything you need to know, including any safety hazards or costly repairs you may face, and we provide photos so you can follow exactly where problems and potential issues lurk. When you have a pre-purchase building and pest report from RBI, you’ll have the confidence that comes with conformance to Australian Standards AS4349.1-2007 and AS4349.3 means you have the perfect tool to negotiate with layers and estate agents. If there is any potential risk to your property investment, it will be clearly highlighted in your report which can be used as grounds to terminate a contract. For you, this takes the stress out of deciding on your purchase and gives you the confidence to move forward. Why Choose Rapid Building Inspections in Caloundra? Our inspectors are highly trained and have years of experience in the building trade, making them the perfect people for you – they’ll spot even those potential problems that other inspectors could miss. As active members of the IBC, we constantly seek to update and improve the capabilities that we offer to you. Our pre-purchase building inspections are always on the cutting edge of what is possible. We follow Australian best practices in pest inspections and meet Australian Standard AS 4349.3. We are authorised to conduct inspections throughout Queensland. Every RBI inspection is covered by our $5,000,000 indemnity insurance. We won’t need it, but at least you know that your decision to buy or not to buy is fully protected. Every RBI inspector carries the Thermatrac t3i and Tramex Moisture Encounter Plus devices which can precisely, detect, locate and confirm the presence or termites without physically penetrating the walls, floors or ceilings – and furthermore, we won’t displace any termite activity that is present. The remote thermal sensor pin-points signification heat sources within conventional structures and the termite detection radar confirms the presence of termites in the suspect areas, as well as detecting nests and entry points. Using a calibrated radar signal, this device identifies termites through timber, brick, masonry, concrete, plasterboard, plastic and other common building materials. No more holes in walls, and no need for tapping or prodding. And because the termites are never disturbed, they remain active for easy and accurate detection by the Termatrac Termite Detection Radar. The Thermatrac t3i hand-held unit’s moisture sensor hand-held unit can measure and record differential moisture levels in building materials without causing any damage. It can identify potential termite risk areas by the concentrated presence of moisture in most surfaces including wood, plasterboard, roofing, plastic, brick and concrete. Our inspectors all carry the ‘Tramex Moisture Encounter Plus (MEP)’. This non-invasive overall building inspection moisture meter is fast, precise and versatile! It can measure and evaluate moisture levels through paint, wall coatings, plasterboard, ceramic tiles, floor coverings, wood, roof coverings and ceilings. We know that your building and pest report is time-sensitive. As long as we have your payment, your report is guaranteed in your hands within 24-hours, but we don’t cut any corners – every pre-purchase inspection report passes a stringent quality check before being sent to you. Our promise to you is to provide a top-quality, totally unbiased pre-purchase inspection report at the best price in Queensland. How? By keeping it simple, and not expecting our inspector to do the negotiating with the seller and the estate agent. Our inspectors are free to concentrate on the job of inspecting properties and getting the reports delivered on time because access to the property is obtained before the inspector gets involved. We ask you to confirm access with the estate agent so that our man-on-the-ground is free on the day to get to our appointment on time. If you can’t get access to the property at the agreed time, all we ask is that you notify is at least 24-hours before the appointment, giving us time to reschedule. What does rapid mean? It means being there on time and delivering your report fast. You get the report within 24-hours or your money back. When can you do the inspection? We never turn down work, and will endeavour to make a slot available for you. Could I attend the inspection? You are welcome to be on-site when the inspection takes place, that way, you can talk to the Inspector directly and discuss any issues. We do ask, however, that you allow the inspector to conduct his inspection unhindered and save questions until he is finished. This helps to ensure a thorough and uncompromised report. Do you check the loft and roof? As long as our inspectors can gain access. This is another way we provide best value Building Inspections in Caloundra . What is included in the report? 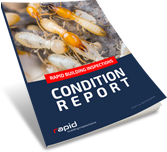 The report includes your building inspection report, pest report or both, all simple-to-understand English. How soon will I receive my report? You’ll get your report within 24 hours of the completed inspection as long as the payment has been made – or your money back! Can I rescind my contract based on your findings? Our condition reports are in meet current Australian Standards and are therefore recognised by estate agents and solicitors. Provided you have special conditions in your contract, RBI’s condition report is known as proof. What happens after I book an appointment? Our concierge team will confirm the details of your property, and at the time agreed, will see that the inspector is there to inspect.